Congratulations to the scientists at Pacific Northwest National Laboratory who were part of teams winning five R&D 100 awards. From cyber security, trace chemical detection, and turning sewage into fuel, to understanding real-world energy processes and forecasting future electric needs, PNNL was part of developing five advancements honored at a recent award event in Las Vegas. Technology known as SPIN – Subambient Pressure Ionization with Nanoelectrospray. The sample boosts the number of molecules available for analysis, making more precise measurements possible. At the heart of mass spectrometry is the ability to precisely measure tiny samples of substances such as chemicals in soil and water or cancer cells in a tissue sample. But collecting those particles and getting them into the ion funnel is challenging. The new development, known as SPIN or Subambient Pressure Ionization with Nanoelectrospray, eliminates this problem completely. 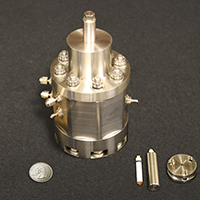 The ion source now creates and sends particles to the funnel in a single system under the same atmospheric conditions. The SPIN team includes PNNL staff members Keqi Tang, Gordon Anderson and Richard D. Smith, and Ryan Kelly, a staff member at EMSL, the Environmental Molecular Sciences Laboratory, a DOE user facility at PNNL. The team also includes Randall Pedder of Ardara Technologies, which has licensed the technology, and former PNNL staffers Jason Page, Ioan Marginean, and Jonathan Cox. 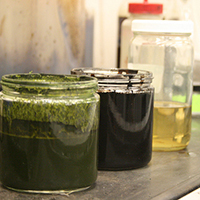 (L-R): Algae slurry; biocrude oil; and, with further processing, refined biocrude which contains mostly the makings of gasoline and diesel fuel. A new chemical processing system converts natural substances as diverse as waste treatment sludge, food scraps and algae into a variety of useful fuels. The system is remarkably efficient, converting up to 99 percent of a feedstock like algae into crude that can be further refined into aviation, gasoline, and diesel fuel. The process also produces methane gas, clean water, and useful plant nutrients. 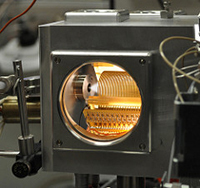 The PNNL team system bypassed an energy-intensive step that most processes require. Utah-based Genifuel Corp. licensed the technology and built a pilot plant for its partner, Reliance Industries Ltd., to create biocrude oil from algae. The team includes PNNL's Doug Elliott, Dan Anderson, Rich Hallen, Todd Hart, and Andy Schmidt, as well as James Oyler from Genifuel. The pressurized magic-angle spinning technology makes it possible to study samples with NMR under real-world conditions. Using NMR spectroscopy in its most effective mode used to require removal of samples from their extreme conditions. This removal changed their properties significantly, limiting the data's usefulness. The new technology allows scientists to tap NMR spectroscopy to watch molecular interactions as they occur in conditions that mimic their real surroundings. The team applied the technology, called pressurized magic angle spinning, to studies involving underground carbon storage, fracking wells, and tracking complex chemical reactions in fuel production. A multidisciplinary team based at EMSL and PNNL includes David Hoyt, Jian Zhi Hu, Jesse Sears, Eric Walter, Hardeep Mehta, and Kevin Rosso, as well as former PNNL researcher Flaviu Turcu. View a list of R&D 100 Finalists for 2015.